So Cal Winter Hop FREEBIES and Giveaway! 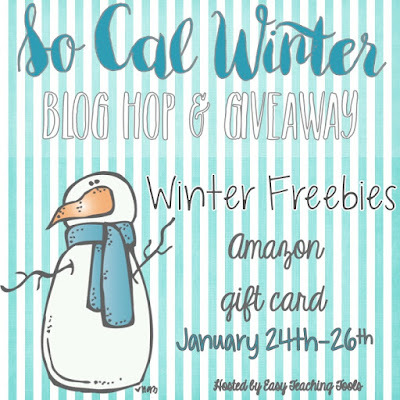 I am so excited to share with you a giveaway, FREEBIES, and some pictures from a California winter! Many thanks to Easy Teaching Tools for hosting this great hop and giveaway! My first picture is from a new shopping area along the Strand in Huntington Beach called Pacific City. I don't live very close to this area but I love to visit it every year since I love being at the beach! I also love fashion so I thought I share a little about that too. Being comfortable and feeling stylish while teaching can happen and be affordable on a teacher budget! Another teacher-blogger was showing off this exact same sweater on Instagram, from Target so I just had to get one too! I absolutely love plaid and I've been so happy it is back in style so I can stock up. I just love the Christmas themed mini Airstream I came across. This is the beach sunset right across from this shopping area. Isn't it beautiful? Finally, I wanted to share my one of my favorite things to wear for our mild Cali winters. I love jacket vests. I got this North Face down jacket several seasons ago at Nordstrom's semi annual sale. This vest pairs nicely with more casual tops like this Harajuku Lovers thermal that I found second hand on Poshmark.com. Since I love to travel I just had to have this top! What is great about living in LA is that you can find so much used, quality fashion in thrift and consignments stores, but if you don't have that option there are many online places like, Ebay and Postmark where you can get good deals too. I also have a light brown, wool and weaved vest from American Eagle, that I found second hand, so I can match it up with more outfits and brown boots. Since our mornings start out chilly and then most of our afternoons warm up to the high sixties I can still stay cool or just remove my vest. 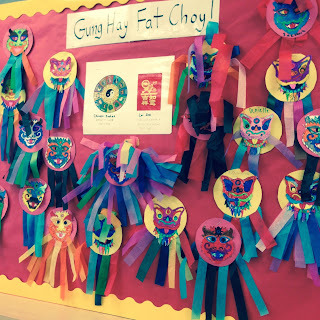 Studying Chinese New Year with my students has been a big hit in my classroom every year! 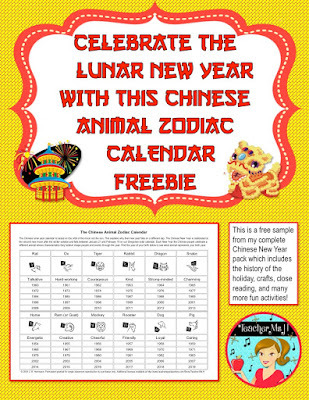 Students love learning about their Chinese Zodiac Animal and all about the holiday traditions. I love being close to so many areas in So Cal that celebrate the Lunar holiday too! I also have some great video of Lions dancers that my students love viewing from this past blog post as well as more tips and books for sharing this holiday in your classroom. I hope you enjoy this CHINESE NEW YEAR FREEBIE! 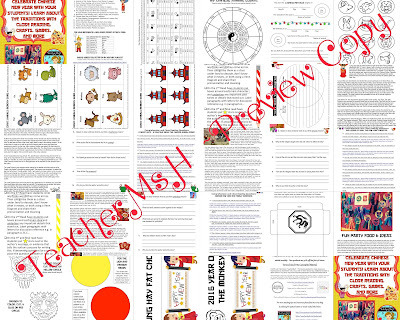 Just click the pic above to get to this FREEBIE which is a smaller sample from this pack below. A picture of the yearly craft we do from this pack. Thanks for reading and I wish you luck in our joint giveaway! You'll also want to hop on over to The Rigorous Owl, and other bloggers participating for more older grade FREEBIES! If you are looking for more Primary grade freebies for K-2 You will want to start over at the hostess with the most-est at Easy Teaching Tools!